When it comes to collector motorcycles, none hold the allure of the classic Harley-Davidson Big Twins built from 1936 to 1964. But owning and maintaining these tempermental machines provides endless challenges. Even the most pristine, restored example needs a tremendous amount of care, maintenance, and repair. The rebuilding and restoring of these machines is not so much a defined task as a never-ending process. This book serves to guide owners through that process. 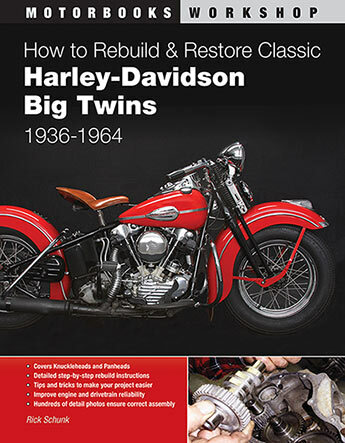 Beginning with a practical section on understanding, choosing, and purchasing a classic Harley, this book focuses on the nuts and bolts of classic Harley ownership. Through step-by-step photography and thoughtful, informative instruction, the reader will learn how to disassemble a chassis, rebuild a fork, lace a wheel, and paint the major parts for any restoration. It also provides thorough instruction on repairing, overhauling, and restoring all major components, such as the engine, transmission, and electrical system. Rick Schunk is an antique bike enthusiast and mechanic. In addition to his wrenching skills, he was the long-time editor for the Antique Motorcycle Club of America s magazine.